Well , Though the view of the economist or the capitalist on Socialism was interesting i couldn’t help myself contradicting with their verdicts. 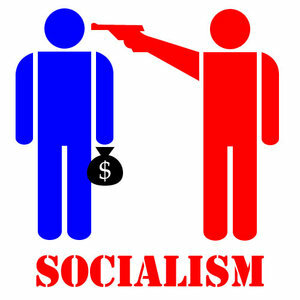 Firstly, it seems that they have misunderstood the whole concept of socialism. Socialism doesn’t insist on giving students equal marks irrespective of their talents or performance, Rather it insists on giving them equal chance of education in the first place. Socialism does not insist on a plumber getting paid equal to a heart surgeon, but it does insist and thrives to give the plumber the same chance to survive and lead his life in the society just like the heart surgeon. Their professions may be different but they are the same in the society as fellow beings. Socialism fights to maintain that equality. It strives to make a interlinked web of people in a society who are dependent on each other to lead a happy life. Let’s take a bit more Mature condition in to consideration. A factory for example where the workers are being paid considerably low wages and the owners reaping huge profits out of the work of the workers. We bring in socialism there, i.e. all are getting the equal pay or at least the worker is being paid with a salary equivalent to the work he does. He gets motivated and starts working more eagerly thus producing huge outputs (surplus) thus resulting in huge gains, which is once again shared by the owner and employee equally which once more motivates him to work harder (With enthusiasm) to earn and close the gap between him and the owner financially. So the so called financial gap between the upper class and the lower class is finally coming to an end. And all lived happily ever after, Well not the owner though as he would have lost the upper hand he held. We cannot take a simple childish scenario like the college or school to explain the theories of capitalism or socialism. The world was not meant for the theory Survival of the fittest any time. If you are born in this world then you have a right to live and the fittest have got the responsibility to make you live. Love and be Loved. Life can have meaning without success, but success can never have a meaning without life!! !